When thousands of people - including Chas's daughter - fall into magically-induced comas, John, Zed and Chas must track down the dark forces responsible. But will Chas pay the ultimate price to save the day? Hellblazer: Original Sins (Zed's background and the mention of The Resurrection Crusade), Hellblazer: All His Engines (a plot involving people in magical comas, including a member of Chas's family) and various Justice League comics involving Felix Faust, especially the recent Justice League Dark series where John fought Felix Faust. Charles Halford is excellent throughout, as we see Chas pushed past his breaking point worrying about his daughter. But for my money his best bit of acting in the whole episode is his wordless reaction to his ex-wife saying, "She's all I have left." regarding their daughter. Chas knows full well his marriage is over but actually hearing the words clearly affect him deeply. Matt Ryan does a similar job of effective wordless acting later on, as he hugs Renee shortly after Chas blows himself up to stop Felix Faust. The expression on his face says it all regarding his feelings for Chas and how much John regrets having ruined his best friend's life by turning him into a weapon against the forces of evil, in spite of all the good they've done since then. Finally, Angelica Celaya doesn't get quite as much to do as Zed in this episode but she steals what few scenes she has as we see her showcasing her compassion in trying to comfort Renee while defending Chas' decisions and in trying a new trick with her powers. The episode title - Quid Pro Quo - is a Latin phrase meaning "something for something", referring to an exchange of goods or services where one transfer is contingent upon the other. Or in plain English - you scratch my back, I scratch yours. The main plot of this episode comes from the Hellblazer graphic novel All His Engines by Mike Carey. The novel also deals with a number of people being put into comas by a magical influence and John's attention being brought to the matter after a member of Chas' family is stricken. The key differences are that the novel is predominantly set in Los Angeles rather than New York City and that the victim is Chas' granddaughter Trish rather than his daughter Geraldine. Zed finally drops the name of the group that seeks her - The Resurrection Crusade. She also tells John that the group's leader is her father. All of this is straight from Hellblazer: Original Sins. The song that trigger's Chas' flashback to how he gained a number of extra lives is Blue Oyster Cult's Don't Fear The Reaper. Curiously, the album cover for the LP the song came from - Agents of Fortune - features a stage magician holding tarot cards, whom bears an uncanny resemblance to DC Comics' magical hero John Zatara. 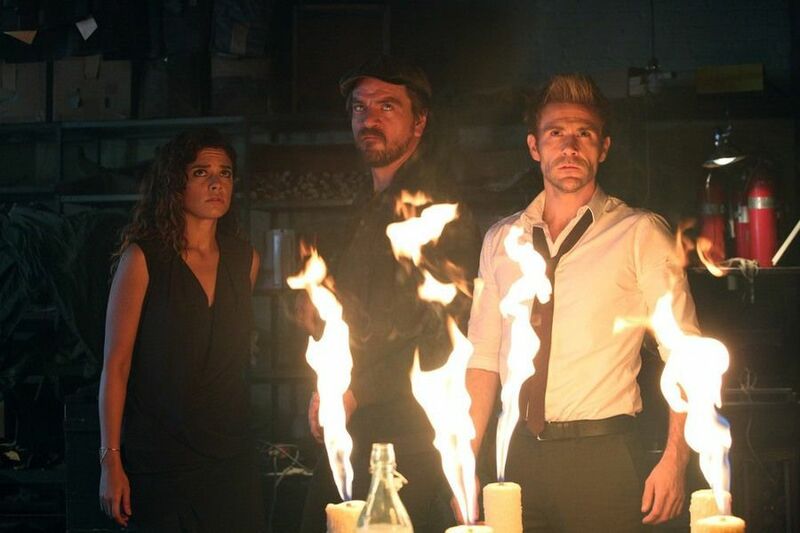 According to Executive Producer Daniel Cerone, the nightclub fire in this episode was inspired by the Station Nightclub Fire of 2003 where over 100 people died due to outdoor fireworks being used as part of an indoor pyrotechnics display. Lillian Axe - the band playing at the club - is a real band. Indeed, they were the first hard rock band to be inducted into the Louisiana Music Hall of Fame in 2010. Thanks to John's protection spell, Chas gains 47 lives from the people who died around him when the nightclub collapsed. Lillian Axe - perhaps not coincidentally - have a song titled 47 Ways To Die. At one point, John drops the name of Aleister Crowley. Described in the press as "the most wicked man in the world", Crowley claimed to be a powerful magician and certainly threw some fairly wild parties. In the Hellblazer comics, John actually knows Crowley personally and knows where he has been hiding since faking his death in 1947. As in the comics, Chas' real first name is Francis. In the comics, he was given the nickname in honor of Jimi Hendrix's producer Chas Chandler. As in the comics, Renee hates John Constantine with a passion. In the comics, this was the case even before Renee left Chas during the Mike Carey run on Hellblazer. Fennel is also the name of the psychic contact John seeks out in All My Engines. And like in the show, Fennel in the comic is burned to death. However, the Fennel in the novel doesn't work in an Army Surplus store. John has never used a cattle prod before. In All My Engines, the main villain is a demon named Beroul who blackmails John Constantine into dealing with his rivals in exchange for freeing Trish's soul as opposed to a human mage. Felix Faust is a reoccurring enemy of The Justice League and various magic-using heroes in the DC Universe, who first appeared in Justice League of America #10 (March 1962). Originally a dark sorcerer in 5000 BC, Faust tried and failed to challenge the most powerful wizard of his age and his soul was summarily banished to another realm. In the 1920s, he was able to take advantage of another sorcerer's mistake, took over his body and adopted the name Felix Faust as he resumed his quest for ultimate cosmic power, repeatedly butting heads with The Justice League in the process. John describes Faust as a lifetime apprentice and second fiddle to the greatest black magicians of his generation. This does match up with the regard most mages have for Felix Faust in the comics, where Faust makes up for his lack of raw power with a talent for research and a willingness to experiment in ways no sane wizard ever would, to say nothing of trading in souls with high-level demons. As in the comics, John has a glass jaw and is easily knocked out with one punch by Chas. John weaves a Duplicity Spell around the Mill House. Rather than making the house invisible, it causes people who are looking for the house to wander onto a path leading away from it. In the flashback, John casts a spell of protection on Chas. Surprisingly, it works despite John being incredibly drunk. We find out later the same spell was used by Merlin to protect specific knights at King Arthur's request. If any knight protected by the spell was killed in the company of lesser knights, the spell would pass their lives on to the protected. In this case, Chas was given the lives of the 47 other people who died in the club fire. John owns a brush that belonged to Alister Crowley. He says that he always takes it with him on a case when he doesn't have a clue where to begin and later uses it to detect evidence of the soul leaving the body on an unconscious Geraldine. John also has a leather cord made from the sinew from Achilles' Heel. According to John it is impervious to magic and has the highest tensile strength of anything in this world or any other. Used as a whip, it can cut off the circulation to someone's hand within seconds. John claims it is Chas' favorite trick. Chapped lips are celestial burn marks and can signify a soul leaving the body. According to John, separating a soul from the body is the Holy Grail of Black Magic for black magic practitioners and no mortal has ever managed it... until Felix Faust. Water from the River Jordan can be used as a magical lubricant to ease communication with lost souls. According to John, only five books contain the spell used to disrupt a seance and kill the medium that was used to kill Fennel, each scattered across the globe by an Irish High King. Zed uses her powers to locate the closest copy of the book. John knows a spell that can dispel elementary cloaking spells. It involves an evocation to the five elements and six directions. According to Felix Faust, Karabasan is a named demon who is stealing the souls he has captured. In Turkish folklore, a karabasan is a type of monster - a boogeyman - who preys upon people while they sleep and scares them to death. Karabasan is also the Turkish word for nightmare and the medical term used to describe Sleep Paralysis. John Constantine and Felix Faust both take a blood oath to honor their agreement, "in the name of Dedi of Dejed-Sneferu - he who endures". Dedi of Dejed-Sneferu is an Ancient Egyptian magician, who is a character in one story contained with the Westcar Papyrus. According to Chas, once a magician dies any spells they have cast that are still on-going will be broken. John makes use of a rock with a hole in it in order to track and detect Karabasan. This rock is known as an adder stone, but is also known as a fairy stone, witch stone, hag stone or aggri. Whatever the name, they are all the same thing - a rock that has had a hole worn through it naturally, usually by water. Looking through an adder stone allows one to see invisible beings and see through magical illusions and glamours. John knows a spell that can induce sleep. He uses this to put Zed to sleep so she can act as bait in a trap for Karabasan. The Monkey King is a trickster figure from Chinese mythology. He was a monkey born from a stone who acquired supernatural powers through Taoists practices, including super-strength, great leaping powers and the ability to shape-shift into one of 72 forms. He was also a powerful warrior and no mean spell-caster in his own right. Zed is briefly able to use her powers to act as a medium and communicate with Geraldine's soul. The amount of time between when Chas dies and when he comes back to life varies depending on how violent the death was and Chas does feel the pain of each death fully. John: You've yet to flinch in the face of The Underworld. Why are you so afraid of a man from this one? Zed: Because he's my father. John: I've heard it said that nine-tenths of reality is perception. And in my trade, it's eleven-tenths. John: All those people wasting away by your hand as life passes them by - that is not the legacy you want, Felix. Felix Faust: And what would you know of legacy? A boastful, smutty, infantile boy? You create magic by accident and insolence while the truly devoted sweat and toil with no reward. You'll never know my magic, Constantine. You will know my pain! Chas: I've watched other people suffer the consequences of your actions but this is my family! So I'm going to do things my way! Not yours! John: Yeah?! And how would you plan to do that?! Chas: My family's suffered enough because of you. Felix Faust: A man of your word, indeed. Chas: I wish that were true. John refers to The Resurrection Army's attempted abduction of Zed in 108. By the episode's end, Chas is down to 30 lives. Renee makes Chas a scrapbook fill of photos and stories about all 47 lives he absorbed. He shows Geraldine the pictures and talks about the friends who are with him every day. Zed apparently spoke to John's mother and he told Zed to tell John that he wasn't responsible for her death. Felix Faust and John Constantine have had dealings in the past. At one point before Chas and Renee were divorced, he missed Geraldine's birthday dinner due to his saving another family from The Monkey King. John gets his medium ally Fennel killed. We find out that Chas' apparent immortality is due to John casting a protection spell on Chas that worked when he didn't expect it to.